Are you happy paying to help with problem Capita contract? This week, as Barnet residents go to the polls, how many will be influenced by the continuing national and local media coverage of the council’s mass outsourcing deal with Capita? Barnet’s Capita contracts are a local election issue. The council’s conservatives and Capita say the outsourcing contracts have saved money and are performing as expected “in many areas”. But a former local Tory councillor Sury Khatri , who has been deselected after criticising the Capita contract, described the deal as “disastrous”. Barnet has paid Capita £327m since the deals were signed in 2013. Capita runs council services that range from cemeteries to IT. Another critic of the Capita contracts is John Dix who blogs as “Mr Reasonable” and is one of several highly respected local bloggers. He has been studying the council’s accounts for some years. He runs a small business and is comfortable with accounts and balance sheets. “I have no problem with outsourcing so long as it is being done for the right reasons. Typically this is where it involves very specialist, non core activities where technical expertise may be difficult to secure and retain in house. “In Barnet’s case this outsourcing programme covered so many services which were core to the running of the council and which in 2010 were rated as 4 star (good). Barnet has been an experiment in mass outsourcing and almost five years in, it appears to be a failure. Shadow Chancellor John McDonnell has entered the debate. He has applauded Barnet’s Unison branch for its enduring, close scrutiny of the Capita contracts. Unison this week published a report on the deal. Earlier this month the national press reported extensively on concerns that Capita would follow Carillion into liquidation. Since the bad publicity, the company’s announcement of a pre-tax loss of £535m, up from £90m the previous year, £1.2bn of debt and a rights issue to raise £662m after fees by selling new shares at a discount, Capita’s share price has risen steadily, from a low a month ago of about 130p to about 191 yesterday. Could it be that investors sense that Capita’s long-term future is secure: the company has a wide range of complex and impenetrable public sector contracts where history shows that public sector clients – ruling politicians and officials – will defend Capita more enthusiastically than Capita itself, whatever the facts? A list of some of Capita’s problem contracts is below the comment. Carillion, a facilities management and construction company, collapsed in part because the effects of its failures were usually obvious: it was desperately short of money and new roads and hospitals were left unfinished. When IT-based outsourcing deals go wrong, the effects are usually more nuanced. Losses can be hidden in balance sheets that can be interpreted in different ways; and when clients’ employees go unpaid, or the army’s Defence Recruiting System has glitches or medical records are lost, the problems will almost always be officially described as teething even if, as in Capita’s NHS contracts, they last for years. It is spin that rules and protects IT outsourcing contracts in the public sector. Spin hides what’s really going on. It is as integral as projected savings and key performance indicators. When Somerset County Council signed a mass outsourcing deal with IBM, its ruling councillors boasted of huge savings. When the deal went wrong and was ended early after a legal dispute with IBM the council announced that bringing the deal in-house would bring large savings: savings either way. Liverpool council said the same thing when it outsourced to BT – setting up a joint venture called Liverpool Direct – and brought services back-in house: savings each time. Barnet Council is still claiming savings while the council’s auditors are struggling to find them. Spinmeisters know there is rarely any such thing as a failed public sector IT contract: the worst failures are simply in transition from failure to success. Barnet’s council taxpayers will never know the full truth, whoever is in power. Even when a council goes bust, the truth is disputed. Critics of spending at Northamptonshire County Council, which has gone bust, blame secretive and dysfunctional management. Officials, ruling councillors and even the National Audit Office blame underfunding. In March The Times reported that Northamptonshire had paid almost £1m to a consultancy owned by its former chief executive. It also reported that the council’s former director of people, transformation and transactions for services, was re-hired on a one-year contract that made her company £185,000 within days of being made redundant in 2016. Her firm was awarded a £650-a-day IT contract that was not advertised. In the same month, the National Audit Office put Northamptonshire’s difficulties down to underfunding. It conceded that the “precise causes of Northamptonshire’s financial difficulties are not as yet clear”. Perhaps it’s only investors in Capita who will really know the truth: that the full truth on complex public sector contracts in which IT is central will rarely, if ever, emerge; and although Capita has internal accountability for failures – bonuses, the share price and jobs can be affected – there is no reason for anyone in the public sector to fear failure. No jobs are ever affected. Why not sign a few more big outsourcing deals, for good or ill? Thank you to FOI campaigners David Orr and Andrew Rowson for information that helped me write this post. “As a direct result, we fundamentally changed our approach in 2015, expanding and strengthening our commercial teams and bringing responsibility for oversight of the programme in-house. Government Digital Service loses “genius” and “national treasure”. Is Sir Humphrey winning campaign to dismember GDS? The dismembering of the Government Digital Service is underway, says Andrew Greenway, a former programme manager working on digital projects for the Cabinet Office. He now works as an independent consultant. His comments in Civil Service World came, coincidentally, as another top GDS official prepared to leave. Paul Downey, GDS’s Technical Architect – who is described by former colleagues as a “legend” and “nation al treasure” – has left to join the Ministry of Housing, Communities and Local Government. Downey is the latest in a long line of leading government technologists to leave GDS, which will confirm in the minds of many that Sir Humphrey has won the campaign to stop GDS interfering in the 100 year-old autonomy of individual government departments. Cabinet Office minister Francis Maude and entrepreneur Martha Lane Fox set up GDS in 2011 to break down departmental silos and have a “single version of the truth” for everything that government touches. Downey helped departments to create new digital services. 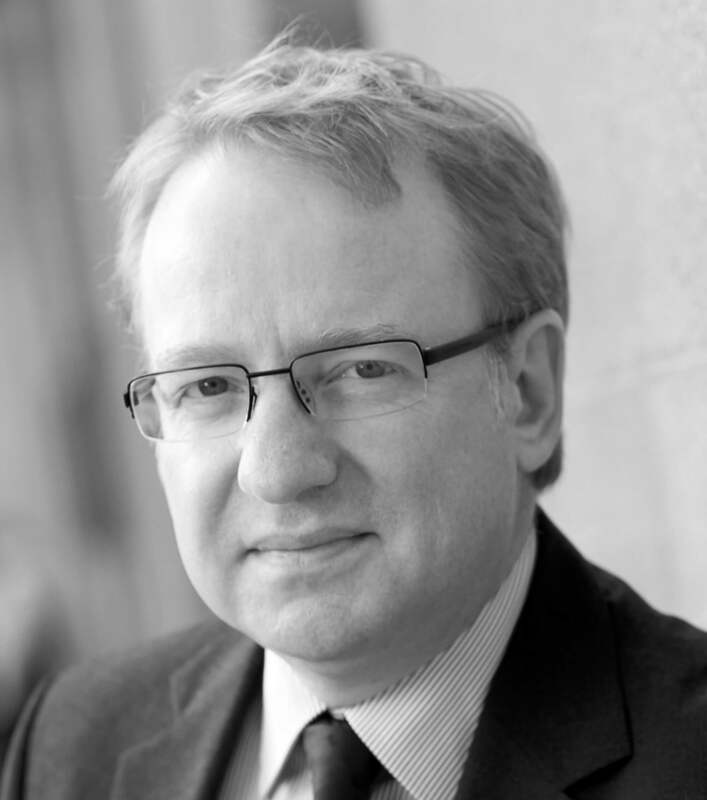 He represented GDS on the UK government Open Standards Board. Formerly he was BT’s Chief Web Services Architect. Mike Bracken, Foreshew-Cain’s predecessor as head of GDS, tweeted about Downey’s departure, “You’re a legend, my friend”. Tom Loosemore, founder of GDS who, in 2012, wrote the Government Digital Strategy for GDS, also tweeted praise for Downey. Liam Maxwell, National Technology Adviser at HM Government who used to be the government’s chief technology officer and who ran teams at GDS, tweeted,”You have been total inspiration to me and hundreds of others”. Greenway said GDS retains people, prestige and power. “There is no question that the civil service is in a much stronger position on digital than it was six years ago. Some of the work going on in government, including the teams in GDS building digital platforms, remains world-leading”. But he added that officials working on digital programmes in other departments describe the GDS team as well-meaning but increasingly peripheral. It now looks as if the Department of Digital, Culture, Media and Sport will take over from GDS. But Greenway warns against replacing a weakened centre with diffuse departmental effort. “The point of GDS was to have a single team that could act as the voice of users for government as a whole. To do that well, it needed a mandate covering data as well as design, operations and technology. It also had to have a clear mission. Increasingly, it has neither of these. talking daily of the need for large-scale “transformative” change while ensuring it doesn’t happen. Thus, for the past few years, GDS professionals have found that top civil servants want central government departments to continue to be run as separate bureaucratic empires with their uniqueness and administrative traditions preserved. GDS technologists, on the other hand, want to cut the costs of running Whitehall and the wider public sector while making it easier for the public to interact with government. This puts GDS at odds with Whitehall officials who believe that each departmental board knows best how to run its department. In the long run GDS cannot win – because it was set up by politicians who wanted change but whose stewardship was temporary while the will to dismember GDS comes from the permanent secretariat who do not welcome change and have the power to resist it. More’s the pity because taxpayers will continue to spend a fortune on preserving departmental silos and huge, unnecessarily-complex technology contracts. The Law Society Gazette reports that the High Court judge in the Post Office Horizon case has called for a “change of attitude”. The case involves a class action – called a Group Litigation Order – against the Post Office brought by more than 500 mostly sub-postmasters. Justice for Subpostmasters Alliance seeks damages related to the introduction of the Horizon computer system about 17 years ago, which is alleged to have caused financial distress and in some cases bankruptcy. The court has heard of problems trying to establish a timetable for the litigation. The claimants sought a substantive hearing for October 2018, while the Post Office argued the case could be managed for another entire year without any substantive hearing being fixed. Under this proposal, the hearing would not happen until at least 2019. Fraser noted that to describe this approach as ‘leisurely, dilatory and unacceptable in the modern judicial system would be a considerable understatement’. The day after a trial was ordered for November 2018, the Post Office asked for a change because its leading counsel already had a commitment at the Companies Court. The judge suggested it was a ‘clear case of the tail wagging the dog’ if clerks were allowed to dictate hearing date. He said there was reasonable notice to arrange for a replacement counsel. It appears that the judge did not single out the claimants or the Post Office as the main target for his irritation. He was impartial. But his no-nonsense approach might have surprised some at the Post Office. The Post Office is familiar with control. When the Horizon system has shown a shortfall in the accounts of a local branch, the Post Office has required the sub-postmasters to pay whatever amount is shown, in order to return the balance to zero. Even when paying the shown amount has led to bankruptcy and destruction of the family life of the sub-postmaster, the Post Office has pursued the case. It supplied the contract that sub-postmasters signed; it supplied the Horizon branch accounting system; it required payment of what the system showed as a deficit; it investigated complaints by sub-postmasters that the shown deficits might have been incorrect; it was able to decide what information to release or withhold – the “known errors” Horizon log being one piece of information not disclosed – and it was the prosecuting authority. It has also been free to rebut public criticisms, as when BBC’s Panorama and forensic accountants Second Sight focused on the concerns of sub-postmasters. Now it’s a High Court judge who is questioning, among other things, a failure to lodge required documents with the court and refusing a to disclose obviously relevant documents. The judge’s comments are refreshing. Since 2009, when Computer Weekly first reported on the concerns of sub-postmasters, control has been one-sided. Now at last it is on an even keel. We hope the Post Office will reappraise whether it should be using public funds at all to fight the case. If the case does drag on for years – postponing a judicial decision – who will benefit? Certainly not the sub-postmasters. Orwell made no mention of goodnewspeak. But maybe today it’s an increasingly popular descendant of Newspeak – a language devised by Orwell to show how the State could use words and phrases to limit thought. This week, as a statue of Orwell was unveiled outside the BBC, a local council in Sussex made an announcement that was a fine example of goodnewspeak. This was Horsham District Council’s way of not saying that it was scrapping weekly rubbish collections. This was the benign side of goodnewspeak. The dark side is a growing acceptance in Whitehall, local authorities and the wider public sector that nothing negative can be thought of let alone expressed at work. This suppression of negative thoughts means that the rollout of Universal Credit can be said officially to be going well and can be speeded up despite the clamour from outsiders, including a former Prime Minister (John Major), for a rethink to consider the problems and delays. It means that the Department for Business, Energy and Industrial Strategy can continue to praise all aspects of its smart meters rollout while its officials keep silent on the fact that the obsolescent smart meters now being installed do not work properly when the householder switches supplier. It means that council employees can think only good about their major IT suppliers – and trust them with the council’s finances as at Barnet council. Goodnewspeak can also mean that public servants do their best, within the law, to avoid outside scrutiny that could otherwise lead to criticism, as at Lambeth council. – The number of managers earning between £50,000 and £150,000 has increased by 88, at a cost of more than £5.5m year. -Spending on Lambeth’s new town hall has gone from a projected £50m to £140m. – The council “invested” a total of £57,000 on its public libraries last year – closing three of them – while spending £13m on corporate office accommodation. -£10.3m was spent making people redundant. These disclosures (and there are many more of them) raise the question of what Lambeth is doing to dispel the impression that it manages public money badly and that its decisions could be routine in the world of local authorities. Lambeth council’s reaction to the audit was to denounce it and issue its own goodnewspeak statement; and it is considering a proposal to lobby the government to allow councils to ban such People’s Audits in future. Lambeth’s website, incidentally, is entitled “Love Lambeth”. Which, perhaps, shows that its leaders have, at least, a deep sense of irony. Orwell wrote in Nineteen Eighty-Four of the Ministry of Truth whose expertise was lying, the Ministry of Peace which organised wars and the Ministry of Plenty which rationed food. Of course goodnewspeak doesn’t exist as a policy anywhere. But its practice is all-pervasive in the public sector. And it seems to change the way people think when they’re at work. It blocks out any view other than the official line. In Nineteen Eight-four, Orwell created “Newspeak” as a language of the Party to coerce the public to shape their thoughts around the State’s beliefs. Its much-reduced vocabulary stopped people conceiving of any other point of view. Not using Newspeak was a thoughtcrime. The Party advocated Duckspeak – to speak without thinking – literally quack like a duck. One worrying consequence is that Whitehall civil servants and public servants and ruling councillors at, say Barnet and Somerset councils (and even at Cornwall), made the assumption that their IT suppliers shared the public sector’s goodnewspeak philosophy. But suppliers are commercially savvy. They don’t exist purely to serve the public. They have to make a profit or they risk insolvency. For years, goodnewspeak at Somerset County Council led to officers and councillors regularly praising the successes of a joint venture with IBM while covering up the problems and losses, in part by routine refusals of FOI requests. Goodnewspeak at Liverpool Council meant that its officials had nothing but praise for BT when they ended a joint venture in 2015. They said that ending the joint venture would save £30m. But the joint venture itself was supposed to have saved tens of millions. Somerset County Council made a similar good news announcement when it terminated its joint venture Southwest One with IBM. Such announcements are consistent with Newspeak’s “Doublethink” – the act of simultaneously accepting two mutually contradictory beliefs as correct. Outsiders can find goodnewspeak shocking. The Daily Mirror reported on how the DWP celebrated the rollout of Universal Credit at Hove, Sussex, with a cake. Were managers mindful of the fact that some failed UC claimants have been driven to the brink of suicide? Francis Maude, when minister for the Cabinet Office, was almost universally disliked in the civil service. He was an outsider who did not accept the Whitehall culture. Even though he believed the UK had the best civil service in the world, he did not always show it. He tried to reduce Whitehall spending on IT projects and programmes that could not be justified. He spoke an IT supplier oligopoly. Now he has left government, most of his civil service reforms (apart from the Government Digital Service) have settled back to how they were before he arrived in 2010. “Based on my experience as a Minister in the eighties and early nineties my expectations (of the civil service) were high. And the disillusionment was steep and distressing. “It remains my view that we have some of the very best civil servants in the world … But the Civil Service as an institution is deeply flawed, and in urgent need of radical reform. But complaints by ministers in all parties about the lack of institutional capability, inefficiency and failed implementation were legion, he said. Perhaps more than any former minister, Maude has expertly summarised the civil service culture but in a way that suggests it’s unredeemable. “I and others have observed that all too often the first reaction of the Civil Service when something wrong is discovered is either to cover it up or to find a scapegoat, often someone who is not a career civil servant and who is considered dispensable. “There seems to be an absolute determination to avoid any evidence that the permanent Civil Service is capable of failure. “Another indicator is that if a Minister decides that a Civil Service leader is not equipped for his or her task, this has to be dressed up as “a breakdown in the relationship”, with the unspoken suggestion that this is at least as much the fault of the Minister as of the civil servant. “It can never be admitted that the mandarin was inadequate in any way. “When I suggested that there might be room for improvement, the distinguished former Civil Service Head, Lord Butler, accused me of a failure of leadership. Actually the leadership failure is to pretend that all is well when no one, even civil servants themselves, really believes that. All is not lost – thanks to a vibrant and investigative local press in some areas and resident auditors such as Mr Reasonable, Mrs Angry, David Orr, Andrew Rowson and the people’s auditors in Lambeth. Along with the National Audit Office and some MPs, these resident auditors are the only effective check on goodnewspeak. They are reminder to complacent officialdom that it cannot always hide behind its barrier of unaccountability. Long may these dogged protectors of the public interest continue to highlight financial mismanagement, excess and self-indulgent,wasteful decisions. Earlier this year Nineteen Eight-Four hit the No 1 spot in Amazon’s book sales chart. Perhaps copies were being scooped up by shortlisted candidates for top public sector jobs as vital homework before falling in with the culture at their interviews. Thank you for David Orr, one of the dogged local resident auditors referred to above, for drawing my attention to some of the articles mentioned in this post. Is Gauke being told the whole truth on Universal Credit’s rollout problems? “It is working,” said Work and Pensions secretary David Gauke in Manchester yesterday. He was referring to a plan to accelerate the rollout of Universal Credit from this month. “I can confirm that the rollout will continue, and to the planned timetable,” he added. But are civil servants giving Gauke – and each other – full and unexpurgated briefings on the state of the Universal Credit programme? Senior civil servants were not passing bad news on the state of the Universal Credit IT programme even to each other. The DWP document was dated several years after Iain Duncan-Smith, the original force behind the introduction of Universal Credit, found his internal DWP briefings on the state of the UC programme so inadequate – a “good news” culture prevailed – that he brought in his own external advisers – what he called his “red team”. In 2013 the National Audit Office, in a report on Universal Credit, said a “good news” mentality within the DWP prevented problems being discussed. If problems could not be discussed they could not be addressed. Last year the Institute for Government, in a report on Universal Credit, said IT employees at the DWP’s Warrington offices burst into tears with relief when at last permitted – by external advisers – to talk openly about problems on the programme. The Work and Pensions Committee has questioned why DWP ministers told MPs all was going well with the programme when it was well behind schedule and beset with problems. The Public Accounts Committee called the DWP “evasive and selective” when it came to passing on information about the state of the Universal Credit programme. Is there any reason to believe that the “fortress mentality” that the NAO referred to in its report on Universal Credit in 2013 is no longer present? 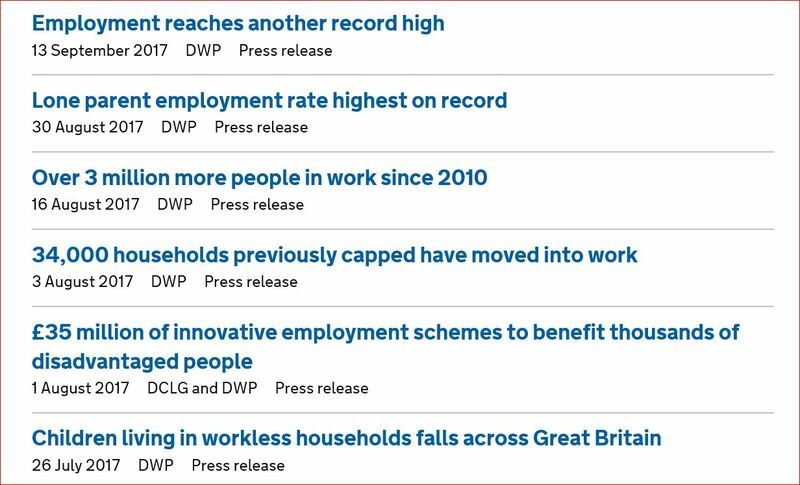 When David Gauke announced yesterday that he is continuing the rollout of Universal Credit, was he basing his decision on the full facts – or a “good news” version of it as told to him by the DWP? David Gauke will have been given the “new minister” treatment when he joined the DWP on 11 June 2017. “The first thing you’ve got to overcome when you walk through the door is that everybody is being almost far too nice to you,” said one of Gauke’s predecessors, Iain Duncan Smith. He was speaking in 2016 after leaving the DWP. IDS was much criticised for assuring Parliament all was well with the Universal Credit IT programme when it wasn’t. But maybe he was right to point out that, when he joined the DWP, he found that the “biggest cultural barrier” was getting civil servants to be honest about difficulties. “The Civil Service, legitimately, see it as their role to deliver on politicians’ policy demands and this can sometimes make them resistant to the idea that they should inform you early of problems,” said IDS. It was IDS who told BBC’s Radio 4 Today programme in December 2013, that Universal Credit was on track. In fact, fewer than 700,000 people are claiming Universal Credit, according to the latest DWP statistics. In the past 30 years, it has been almost unknown for the DWP’s mandarins to concede that they have had serious problems with any of their major IT-based projects and programmes. Perhaps it’s understandable, then, that Gauke apparently refuses to listen to critics and continues with the accelerated rollout of Universal Credit. Would he have any idea that the Citizens Advice Bureau, in a carefully-researched report this year, said that some claimants are on the DWP’s “live service” (managed by large IT suppliers) which is “rarely updated” while other claimants are on a separate “full service” – what the CAB calls a “test and learn” system – which is still being designed? Would Gauke know of the specific concerns of the all-party Work and Pensions Committee which wrote to the DWP earlier this year about Universal Credit decision makers being “overly reliant on information from [HMRC’s] Real-time information” even when there is “compelling evidence” that this data is incorrect? Would Gauke have any reason to believe those who refer to regular computer breakdowns and inaccurate and inconsistent data? Many staff believed the official line was ‘everything is fine’. Nobody wanted to be seen to contradict it. All this suggests that the DWP will carry on much as before, regardless of external criticism. Individual ministers are accountable but they move on. Their jobs are temporary. It’s the permanent civil service that really matters when it comes to the implementation of Universal Credit. But mandarins are neither elected nor effectively accountable. There may be some comparisons between Universal Credit and the NHS IT programme, the £10bn NPfIT. A plethora of independent organisations and individuals expressed concerns about the NPfIT but minister after minister dismissed criticisms and continued the rollout. The NPfIT was dismantled many years later, in 2011. Billions was wasted. Based on their civil service briefings, NPfIT ministers had no reason to believe the programme’s critics. Universal Credit has more support than the NPfIT and the IT is generally welcomed, not shunned. But the Universal Credit rollout is clearly not in a position yet to be speeded up. Whether Gauke will recognise this before his time is up at the DWP is another matter. Like IDS, Stephen Crabb and Damian Green – all secretaries of state during the rollout of Universal Credit – Gauke will move on and his successor will get the “new minister” treatment. 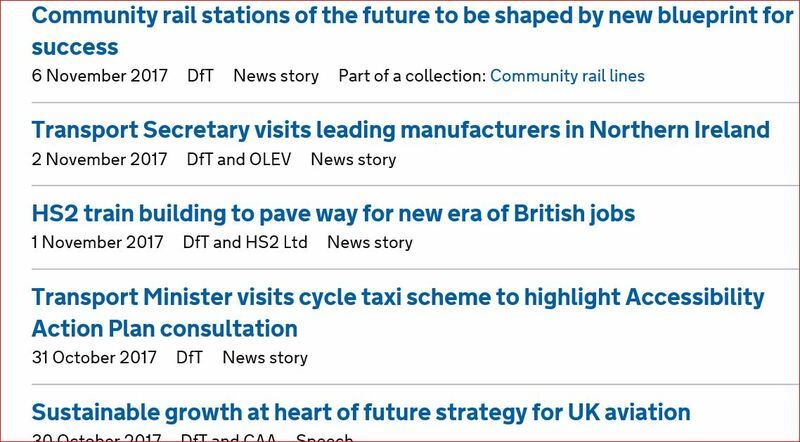 And the cycle of ministerial “good news” briefings will continue. Perhaps the DWP’s senior civil servants believe they’re protecting their secretaries of state. Thank you to David Orr, an ardent campaigner for open government, who alerted me to Universal Credit developments that form part of this article. MPs suggest Cabinet Office is losing its grip on departments – but does it care? The Register has an excellent piece by Kat Hall on how the Cabinet Office is losing its grip on Government departments. Citing the annual report of the all-party Public Accounts Committee, Hall says there are issues where “departments repeatedly don’t do what they have been told or asked to do by the centre”. “government departments are winning significantly more exemptions to splash the cash on expensive IT projects since the departure of former Cabinet Office minister Francis “Mad Frankie” Maude last year”. Chair of the Public Accounts Committee Meg Hillier said: “After my second year as Chair I am increasingly concerned about the long-term accountability of senior civil servants. “The game of musical chairs starts as one Permanent Secretary moves on and they all change jobs in the system. And few are in post long enough to have a vested interest in the long-term aims of their department or a project. Universal Credit and HMRC’s plans to overhaul its Aspire IT contract – the biggest in Europe – were outlined as being two areas of concern. As was the Home Office’s Emergency Services Network. “The Home Office seemed to downplay the risks to the contract and its being caught unawares by the contractor does not reassure us that the Department is on top of the contract or this project. This could cost the taxpayer dear,” it said. It’s hard to argue with a comment on Hall’s piece by @JagPatel3 who suggests that some in Whitehall are as preoccupied with spin as with the efficient delivery of public services. “… Government is preoccupied with presentation, manipulation of words and the dark art of spinning – instead of working on its programme of reform to deliver public services efficiently, to satisfy the wants, needs and expectations of the electorate. “The political imperative of needing to put a positive slant on everything the Government does or will do, irrespective of whether it is true or not, is the reason why spin has become the centrepiece of this Government’s communications strategy. The commentator also says that the “intense focus of attention on presentation alone has resulted in a massive gap opening up between the leadership and lower ranks of the Civil Service, who have to deal with the reality of delivering public services on the ground, on a day-to-day basis, which has in itself, led to alienation and disaffection”. A good summary. Many ordinary civil servants are doing the hard work of delivering public services while a few of their masters are preoccupied with keeping what they do secret and justifying or defending all else that is published in National Audit Office reports, other third-party reports or leaked emails. It’s hardly surprising the Cabinet Office is losing control of departments. Since Maude’s departure it doesn’t want control. It has become clear that it wants, in a hassle-free way, to continue with Sir Humphrey’s non-integrated approach to government.